First thing to remember, by the way, is that the Festival and the Auctions are not the same thing – they just happen at about the same time. The Mistletoe Festival is a relatively new creation, some 4 or 5 years old, established to celebrate Tenbury Wells' mistletoe heritage, at a time when continuation of the auctions seemed unlikely. The Auctions have continued so far, but as feared, they have already been forced to move location from the town centre, so the Festival is the only mistletoe event actually in Tenbury itself. Location will be, as last year, at the sports ground at Little Hereford (nowhere near Hereford itself, just a few miles west of Tenbury – for a location map click here). 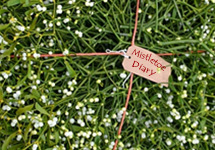 The Mistletoe Festival itself will be taking place on Saturday 6th December. I'm not directly involved this season, though I am still, by default, i/c the festival website. But I don't yet know the programme – so can't tell you much yet about the plans for the day. Likely events include the Crowning of the Mistletoe Queen, street entertainment and mistletoe-based activities/stalls. And maybe the Mistletoe Ball in the evening. But you'll have to wait for another week or two for detailed news and programme. Mistletoe Day will be, as is now established by a long tradition stretching back, ooh, almost 5 years, on Monday 1st December. Not sure yet about events for that either. It's a long time since my last entry – but hey, mistletoe is a very seasonal thing you know. And I've been very busy on non-mistletoe stuff – a man can't live on mistletoe alone. It was a good mistletoey late winter and spring – lots of mistletoe activity – walks, talks, sales of TEME mistletoe grow-kits, and reviewing mistletoe plantings in some key London locations – but it seems a bit late to describe all of that now. I didn't blog it at the time as I was rather pre-occupied with other matters. But it's getting close to the new season now, and the enquiries are beginning to come in – mainly from the media, and from photographers wanting mistletoe for fashion shoots etc. Most of these have to be put off – as mistletoe in early-mid summer just doesn't look right – small green oval berries and semi-developed new leaves. Ok at a distance perhaps but not close-up. So, it's probably time I finally updated the mistletoe website, in anticipation of the new season – and the various mistletoe initiatives (you'll read about them here first) that will be taking place. But not today – I need to get a few things sorted out first….